Sitting around the train station both coming and going to the winery took up more time than the tour of the winery. Lunch on the train was fine but rushed.This time( our second) was not as good a tour of the winery and the guide spent the most time trying to sell wine rather than give an informative tour....kind of sad. We had a blast! Every single part of this tour was amazing. We took a ferry from San Francisco, and then were picked up in a beautiful luxury van for the trip to the train station. Our driver showed us some of the sites, and when we arrived at the train station, we checked in with the extremely friendly staff, and had a beautiful, comfortable and roomy lounge to wait for our train. Being from the east coast, we aren't used to such unending courtesy, but it felt wonderful! The train is magnificently restored, and beautiful, so our ride was wonderful. We were pleasantly surprised at how delicious the food was too, and our Ambassador tour gave us a tasting at two wineries. We toured Krug and Raymond, which was a great choice since it gave us the historic and the modern, and we had a blast. Plus, tasting all that wine didn't hurt, but this was a beautiful day, and we were treated so wonderfully, like were were old friends coming for a visit. This is a must do and we had a great time! The train was great. The food was excellent. BUT THE SERVER? About as 5 star as it gets. What GREAT service. Made the entire trip and well spent time. Should have done this sooner. The core part of the tour which was the Vineyard tour and the Train tour was wonderful. The transportation to Napa and the transportation back to San Francisco was confusing because of the Holiday. The problems were due to the fact that this tour was on a Holiday Monday. Our written instructions differed from the way it actually went because the Ferry schedules were on Holiday hours, but virtually nobody on the tour knew that. In fact, we nearly missed the last Ferry to SF at the end of the tour because our bus driver gave us the wrong departure time. Only by observation and word of mouth kept us from being stranded in in Vallejo. The to/from SF logistics for Holidays need some work! Take this tour on a regular day and you will probably be fine. This was such a wonderful tour for my bday! The train, the food and amazing staff. Then the winery ...wow. Amazing vino and grounds. Excellent from beginning to end. Our bus driver made the tour...the fires broke out that evening so sad as he was from Santa Rosa..hope he and the family were fine. This was a good trip but not one that I would recommend. 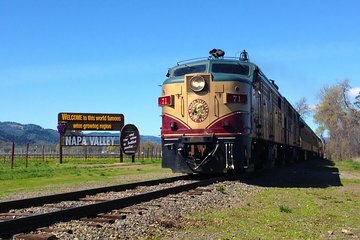 We waited at the Napa train for 1 1/2 hours after our train ride and tour of Raymond vineyards. The tour and tasting was informative. At the station we asked repeatedly if we could access the shuttle to the ferry earlier because we did not want to shop in Vallejo which is a small town. We were told we had to wait until other tours arrived. About 15 minutes before the 4:00PM scheduled shuttle departure I went outside and saw the shuttle. About 5 minutes later one of the reservation persons came out and said there are no other guests and we could have left earlier. The shuttle attendant had been there for over an hour! The train ride was fine. Food excellent. Just a lot of ferrying, shuttling, waiting. I think a bus tour would have been easier and a more efficient way to accomplish this tour. Excellent! I am glad I did not miss it.